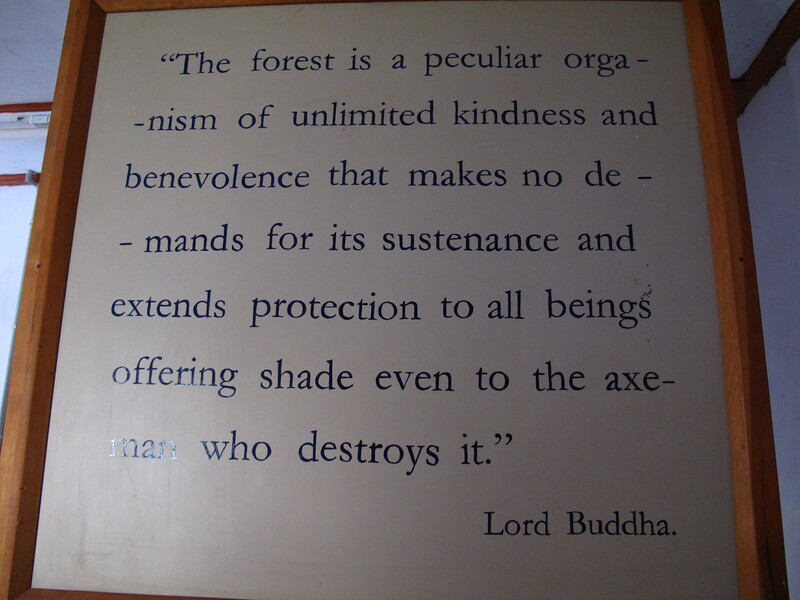 This sign is part of a display in the Jigme Dorji National Park visitors centre, which typifies for me the inextricable link between the Bhutanese practice of Buddhism and their approach to environmental conservation. Bhutan has made a commitment to maintain 65% of the country as forest (it is currently sitting at 72%). As such, Bhutan is the only country in the world that absorbs more carbon that it produces. 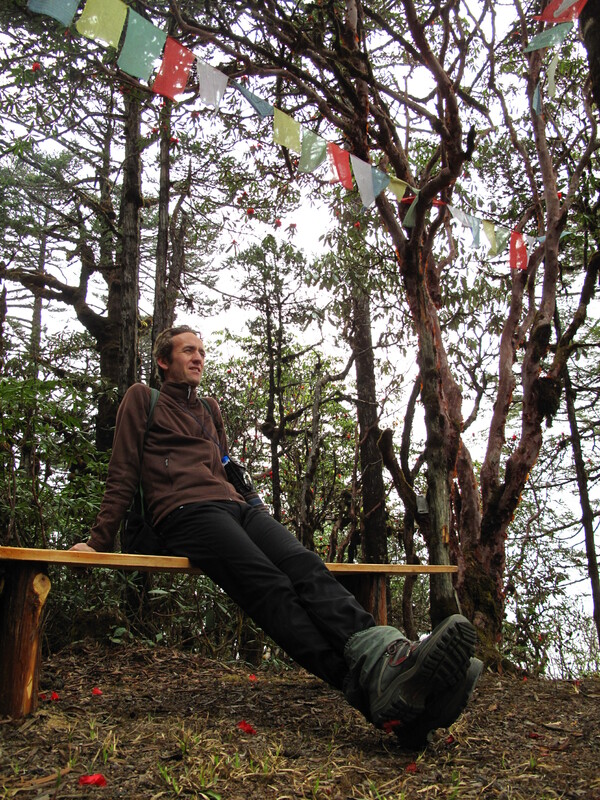 Many of the foreign tourists are attracted to Bhutan for its amazing trekking. With its mountainous terrain offering spectacular views, the incredible biodiversity of its flora and fauna and the extent of forest cover, it’s not hard to see why. 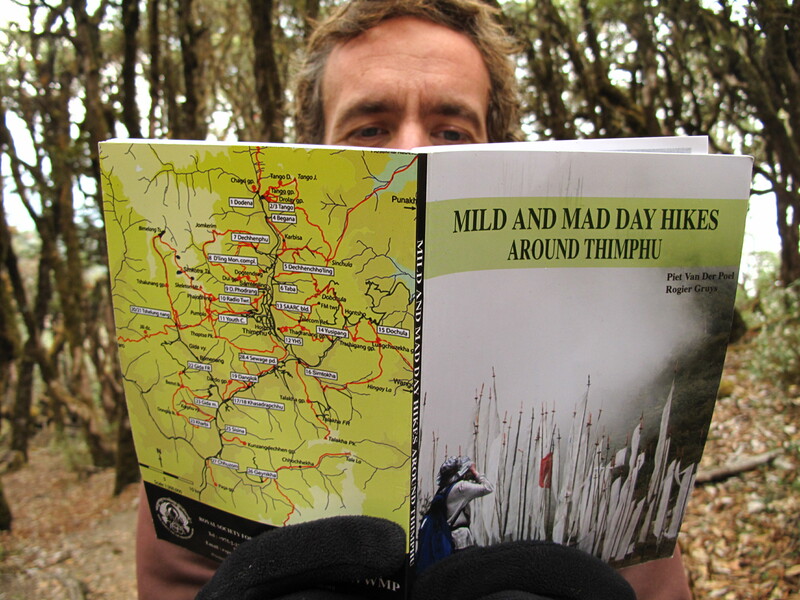 Early in our stay we picked up a copy of “Mild and Mad Day Hikes around Thimphu” written by a Dutch expat and we’re slowly making our way through them. It would seem sensible to start with the mild and work towards the mad – but Jordi, of course, learned this the hard way! 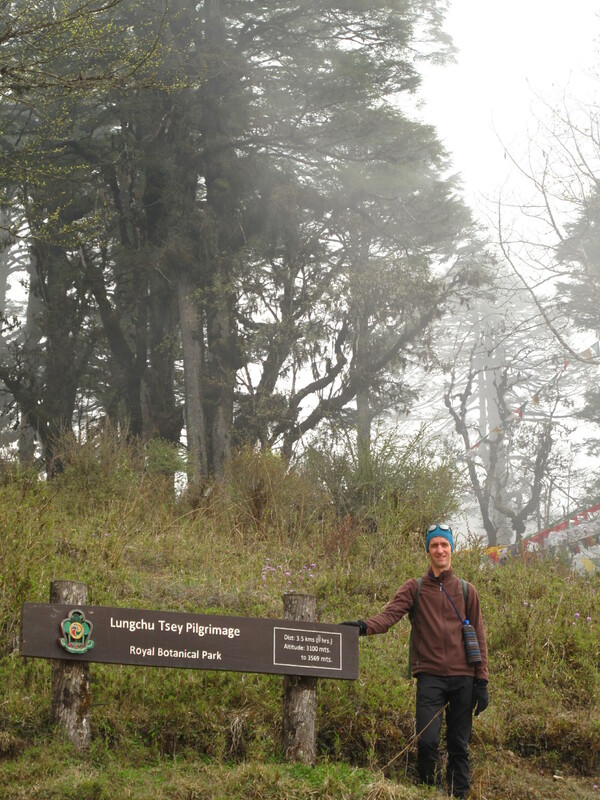 In his commendable enthusiasm, he accepted an invitation on the first weekend we were in Bhutan, to join the crazy Dutchman and a few others for a hike to Phajodhing monastery and beyond to skeleton mountain sitting high above Thimphu at 4100m ASL. For much of the time they were walking/running through snow and he came back and collapsed into bed with a splitting headache from the altitude! During those first couple of weeks in Bhutan, simply walking up stairs around town was enough to make us unusually breathless, let alone embarking on a 20km hike. But we’ve acclimatised now and have since done the Phajodhing walk again. This time all the snow had melted and grass was growing through for the yaks and donkeys to feed on. 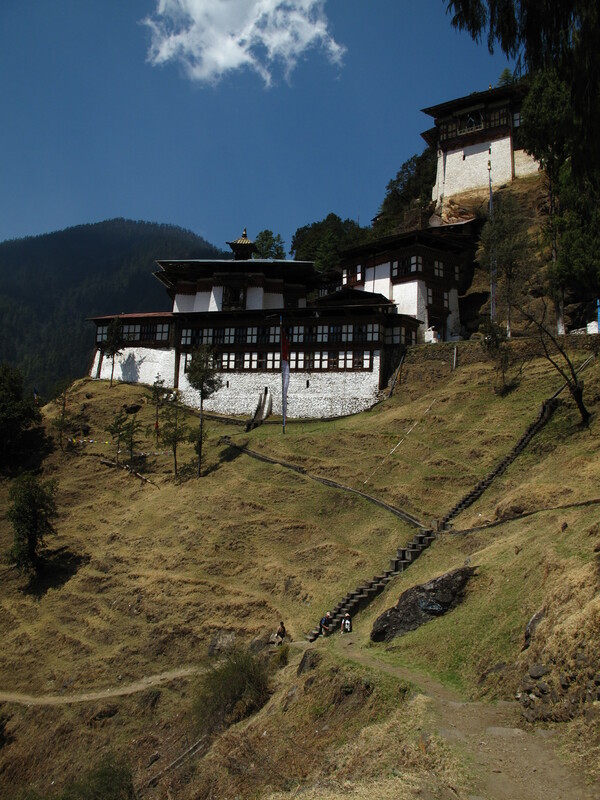 Many of the hikes in Bhutan, such as the walk to Phajodhing, are pilgrimage walks involving steep climbs to monasteries high in the hills to receive blessings from the resident monks. This one took us 3 hours to walk up and 2 hours coming back down. Jordi took his frisbee and showed a couple of young monks how to throw it. Soon the monks came from everywhere and the soccer field behind the monastery became a frisbee field … until, that is, the frisbee became lodged on the monastery roof! But no matter, an agile young monk climbed the wood pile and dislodged the frisbee in no time. Another popular pilgrimage walk is the shorter one to Cheri Monastery, further north up the valley from Thimphu, which I did a few weeks ago. It is situated on the edge of Jigme Dorji National park which extends from here all the way to the Tibetan border. To briefly explain the geography of Bhutan, it essentially consists of several river valleys running from the high peaks in the north and converging in the south. The main settlements are in the valleys. There is one main road that traverses the country from west to east negotiating the high mountain passes to link the main settlements. While the official speed limit on this road is 50km/hr, since it is so narrow and winding, it’s impossible to go more than about 30km/hr safely. It therefore takes 3 days to drive from the west to the east of the country – as the crow flies, this is a distance roughly the same as Newcastle to Wollongong in Australia! 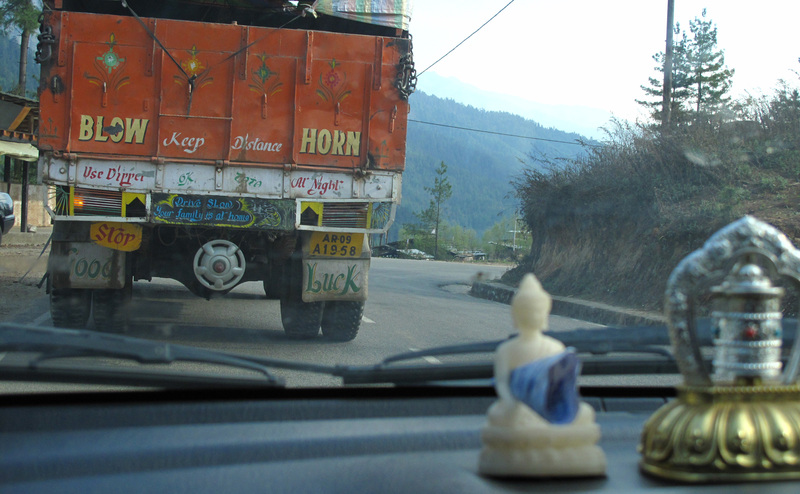 It’s common to see messages on the back of trucks such as “Drive slow, your family is at home” and dashboard shrines containing Buddha statues and prayer wheels. A couple of weeks ago we ventured east of Thimphu for the first time. It was a day trip to visit the second annual Rhodedendron Festival in the Royal Botanical Park about 30km east of Thimphu. Some of the other Australian volunteers had been involved in organising the event through their work with the Department of Forests. As foreigners, each time we want to travel outside of Thimphu/Paro district it’s necessary to obtain a route permit from the Department of Immigration. These are then checked at the various checkpoints along the road. As I understand it, the main purpose of the route permits is to keep a record of where all the foreigners are at any one time in case of landslides etc. So, given the seriousness of this route permit process, I was therefore expecting that the checkpoints would be quite substantial – probably a gate across the road, perhaps some armed guards? So it was a bit of anti-climax when our taxi driver almost went sailing past! 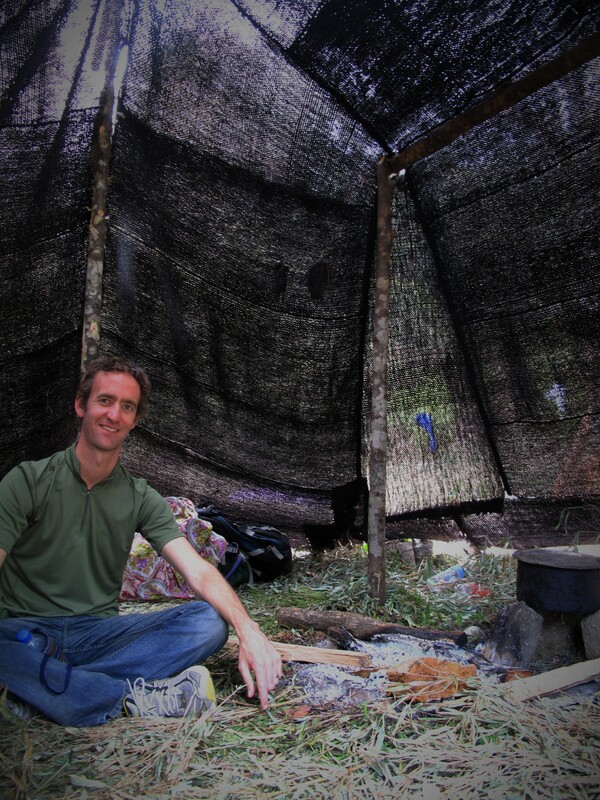 The checkpoint consisted of a permanently raised barrier and a man in a little hut at the side of the road. The Royal Botanical Park at Lampelri, just over the Dochula pass heading east from Thimphu is part of a biological corridor that links Jigme Singye Wangchuck National Park in the centre of the country with Jigme Dorji National Park in the north of Bhutan. 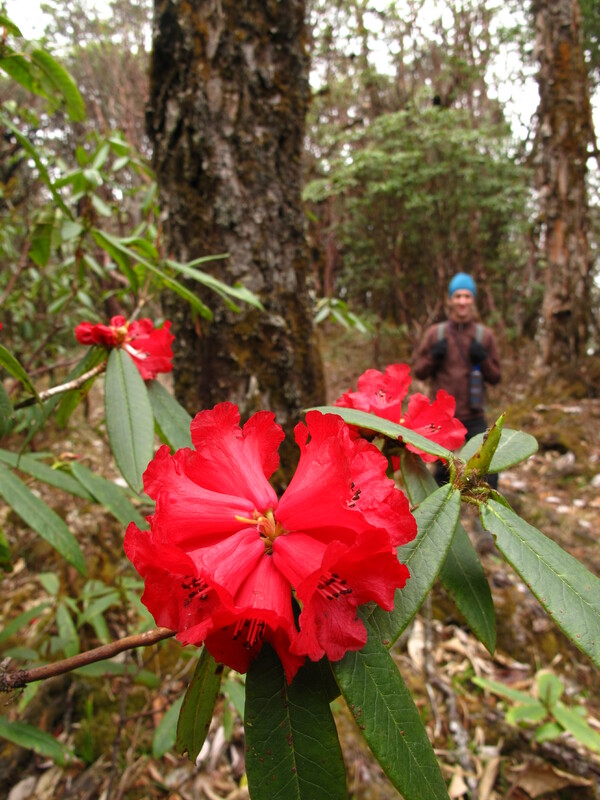 Since it traverses a range of altitudes (2100 to 3800m ASL), it is home to a huge range of flora and fauna species, including 29 species of rhododendron. The park is also used by the nomadic Yak herders who bring their herds down to the lower altitudes during the winter and take them back up to the higher altitudes during the summer months. 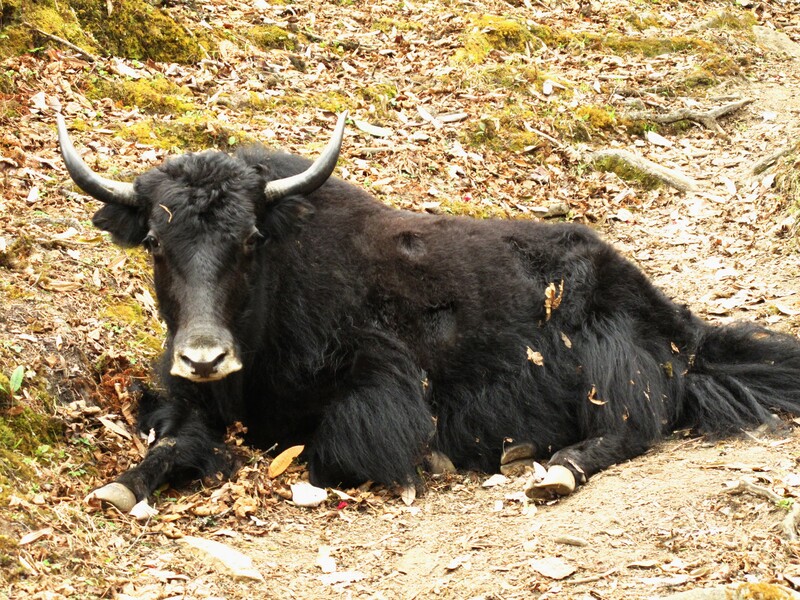 So it’s not unusual to run into some Yaks when you’re out walking! 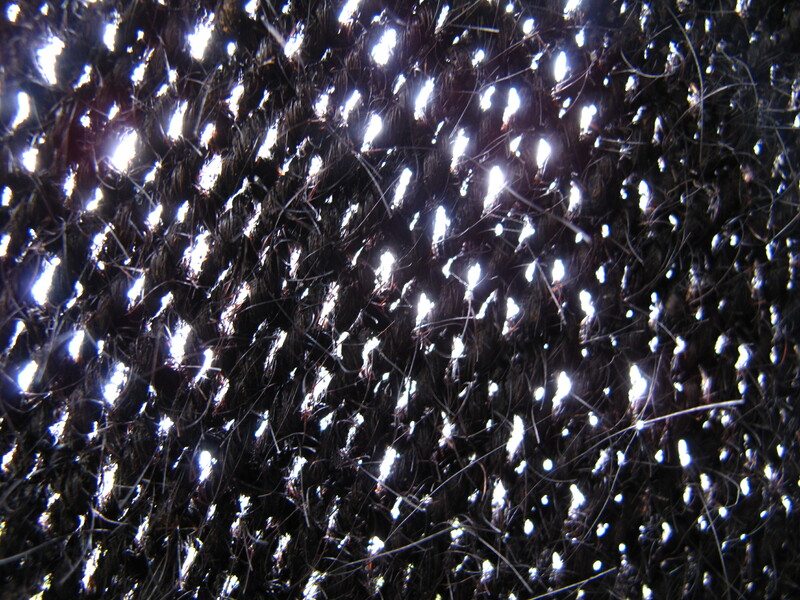 At the festival we met some Yak herders and sat for a while in their tent, woven from Yak hair. Amazingly, the microfibres and the natural oils of the hair keeps any rain and snow out. 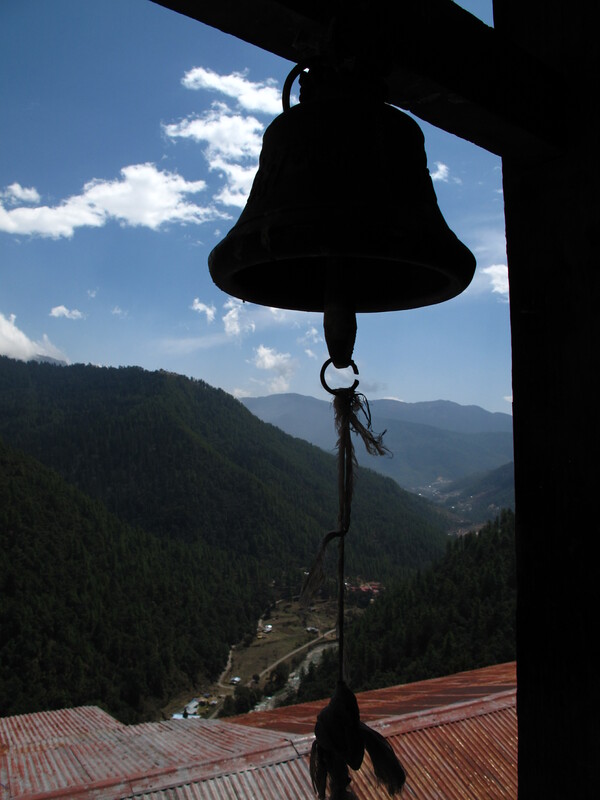 Another beautiful pilgrimage walk in this area follows the ridge line from Dochula pass up to Lungchusey monastery. 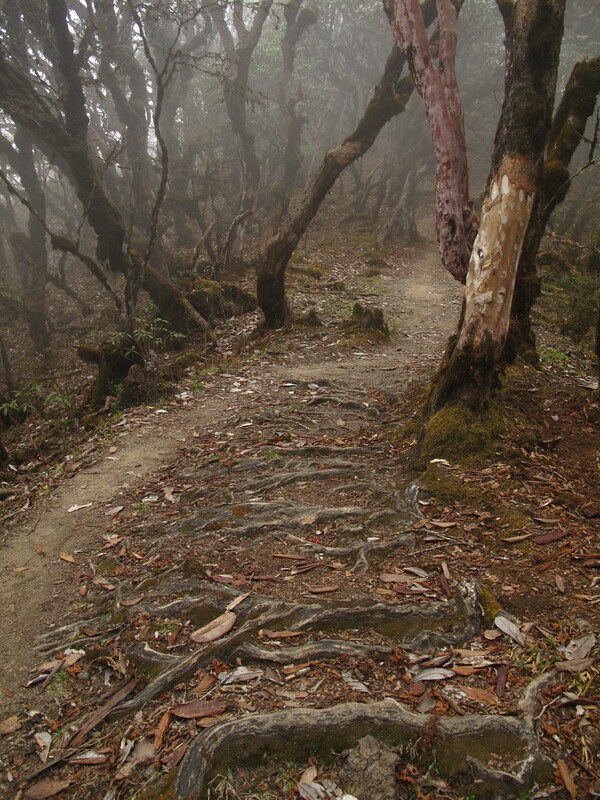 The mist brought an eerie atmosphere to the forest but there were splashes of colour from prayer flags flapping in the breeze and the forest floor was dotted like confetti with red rhodedendron petals. At the top is a collection of modest huts with 5 resident monks. 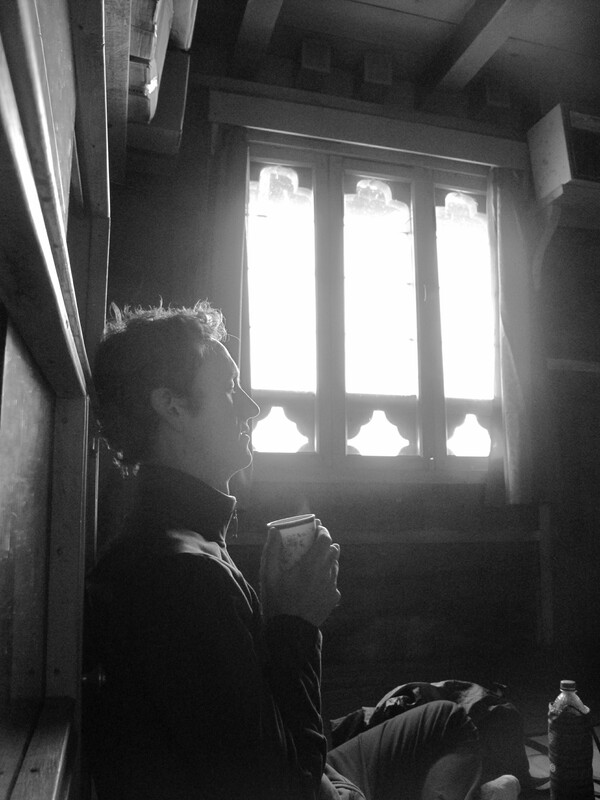 One of them invited us in for a very welcome warm cup of sweet, milky tea. He told us he’s been living there and meditating for 5 years. He walks down the hill and into town for supplies once a month. 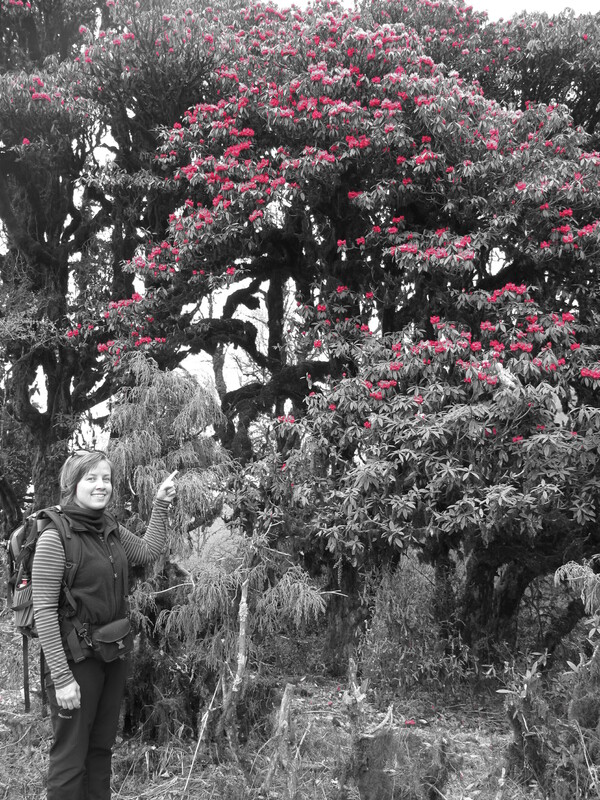 Looking forward to many more hikes in beautiful Bhutan. 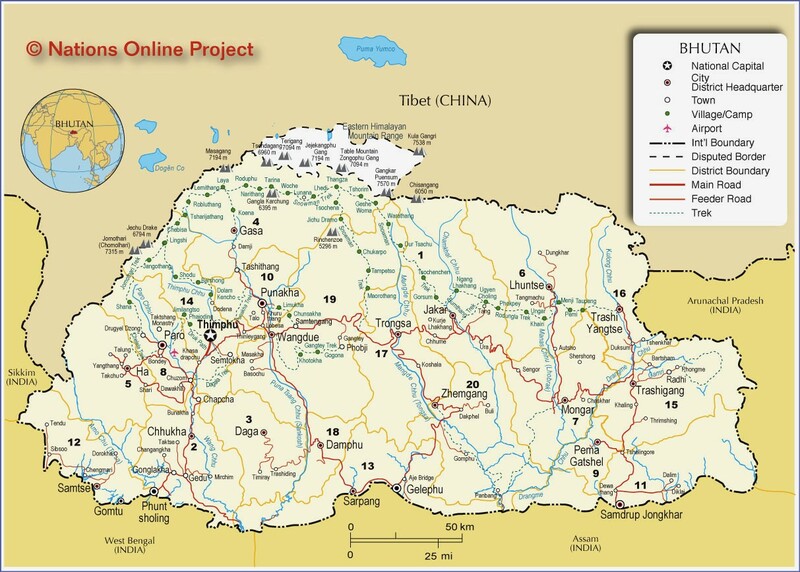 This Post was tagged altitude, biodiversity, biological corridors, Cheri monastery, day hikes, Dochula, forests, geography of Bhutan, Himalaya, Jigme Dorji National Park, Jigme Singye Wangchuck National Park, Lampelri, Lungchusey monastery, mad and mild, monks, mountains, national parks in Bhutan, Phajodhing monastery, pilgrimage, prayer flags, rhodedendron festival, Royal Botanical Park, Thimphu, trek, valleys, yak herders, yaks. Bookmark the permalink. Jordi takes a frisbee on a mountain hike! Why are we not surprised, haha! 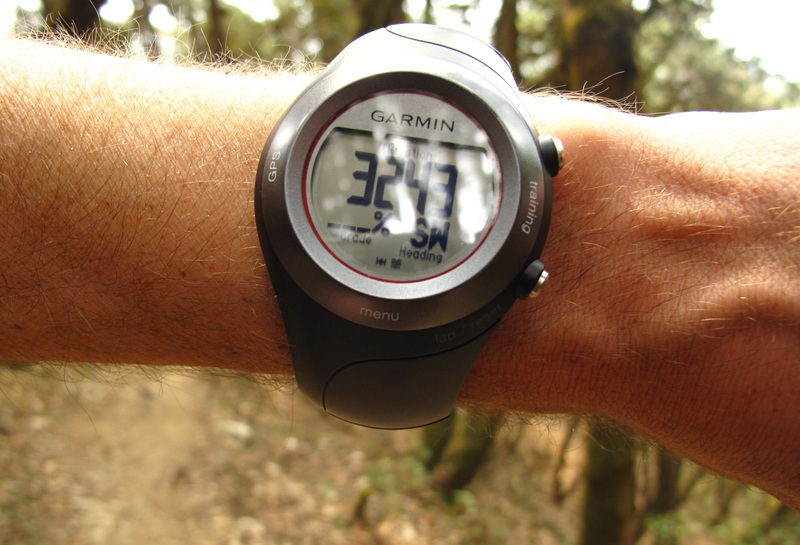 That hiking book sounds great, but I can’t imagine doing all that at such a high altitude! Impressive (although Jordi’s first one sounded dangerous)! Thanks again Jen for sharing your experiences with us in this beautiful country. Enjoy all that you can. How lucky you are !